On the first $50,000 in purchases per year at eligible gas stations, grocery stores, dining and entertainment; 1 point per dollar thereafter. The average dollar value of an individual Scotia Reward Point is $0.01. To see how we calculated this, click here. Login to your Scotia Rewards account, using your card number and password. 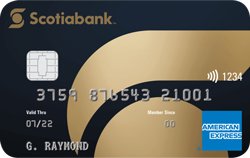 If you DO NOT have an online Scotia Rewards account you can create an account online at https://www.scotiarewards.com or you can redeem points over the phone by speaking to a Scotiabank travel agent at 1-800-665-2582. Points can be redeemed for travel – flights, hotels, and car rentals. The Scotia rewards program allows you to book travel through any provider and then redeem points towards the travel, once the transaction is posted on your account (EXCEPT if you have a Scotiagold passport card). In the rewards centre, you can view your travel purchases and can choose to redeem points towards a purchase. After redeeming points towards a travel purchase, your account will be credited back for the cost of the travel in 7-10 days. For a limited time, receive a $100 e-gift card to Amazon, Cineplex, or Indigo when you apply through Ratehub.ca and are approved. 15,000 bonus points ($150 value) with your first $1000 in everyday purchases in the first 3 months. Book and redeem for travel anywhere, anytime, with no travel restrictions. See Issuer’s site for full details.